Rinse the turkey and pat dry. Finely chop half the pancetta and cut the other half into large chunks. Stuff the large chunks of pancetta, half the rosemary leaves and the whole heads of garlic into the cavity of the turkey. Transfer the finely chopped pancetta to the workbowl of a food processor with the remaining rosemary, minced garlic, salt and pepper. Pulse until everything is finely chopped. Loosen the skin of the turkey over the breast and around the legs. Slide the pancetta mixture over the breast and legs, under the skin, patting it out evenly. Transfer to a roasting pan and rub the turkey with olive oil. Tie the legs loosely. Roast for 3 to 3 1/2 hours, basting the turkey with 1/2 cup of the red wine every 30 minutes. After the second basting, scatter the shallots in the bottom of the roasting pan. Remove the turkey from the roasting pan. Degrease the juices with a fat separator or skim with a spoon. Strain through a sieve into a pot; keep warm over low heat and adjust the seasoning. Remove the whole garlic from the cavity and separate the cloves. Remove and discard the pancetta and rosemary, or save to us in soup. Let turkey rest for 15 minutes. Carve the turkey into slices and garnish with the cloves of garlic, which are meant to be eaten. Serve with the pan juices on the side. Serves 8. Buy yourself an instant read thermometer and use the recommendations below for meats and fish. Having an instant read thermometer takes all the anxiety and guesswork out of cooking meat. To use it, insert the thermometer into the thickest part of the meat so the point is in the middle, and give it a few seconds to adjust. 115 F. to 125 F. Medium rare. Roasts, big steaks and large birds should sit for at least 10-15 minutes before slicing. As the meat rests, in continues to cook, so keep this in mind when checking the temperature. It is recommended that poultry be cooked to 180 F. I personally find chicken and turkey cooking to this temperature to be overcooked and extremely dry, but I can’t tell you to do as I do in this instance. This is one of my favorite methods of roasting turkey. It emerges from the oven well seasoned and succulent. The most memorable part of this dish was the skin. The rosemary and garlic made the skin so delicious that I found myself going back for seconds of the skin alone, which was unheard of. The meat was moist and savory, and I look forward to trying this turkey again. Hopefully in another month or so for a proper Thanksgiving! Not only did the turkey LOOK good, it tasted great. 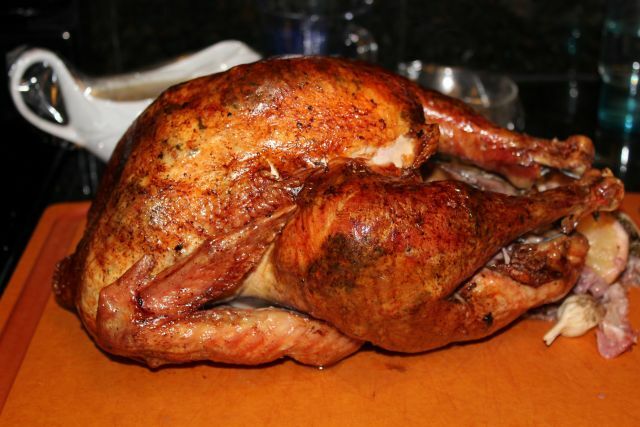 White meat, dark meat, you just can't lose... An excellent way to prepare a turkey! It was the juiciest turkey I've had, every bit as good as a deep fried turkey without all the danger of a pot of boiling oil. The pancetta and garlic give it a great flavor.